The US political system is like daisyworld. 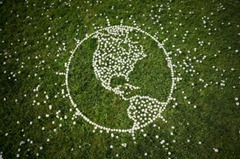 Daisyworld is a simplified model of the Gaia (Earth as organism) Hypothesis. A planet is populated by black daisies which absorb more solar radiation and white daisies which reflect it. Over time the temperature of the planet is regulated because the white daisies thrive when it’s warm. If it’s too hot the white population booms, increases the albedo of the planet and cools it down again. The black population then surges as the planet cools down and causes lower albedo and thus another round of warming. This isn’t (directly) a post about global warming or race. Replace the daisies with Democrats and Republicans. When Democrats are in power Republican voters are driven to the polls and vice versa. Homeostasis is guaranteed. Like daisyworld or the two-body problem it’s a toy system. It’s just never going to produce interesting results. I think it’s time to break up the big parties (like the big parties should have broken up the big banks). Each party that achieves more than 20% of the popular vote is forced to split into two smaller parties. We have more than daisies. We have the three-body problem. In addition to introducing some much needed chaos this could also turn the national political climate from us-vs-them to something more nuanced. Yes, there would still be left leaning and right leaning parties but they’d be forced to differentiate themselves through more than name calling and head stomping. We might have a political marketplace of ideas rather than affiliations. Anything would be better than daisies. america needs a multi-party parliamentary system and a stronger constitutuion and bill of rights. left versus right - or black and white - does not work with a grey, pluralistic society or a secular state. wake and smell the bloodshed in history - and vote for a truce that protects everyone. the state is a constitutional republic and society is a liberal democracy.